I realized that I never explained what I’m doing in Vienna and why I want to learn German! I just started an internship with an NGO called Women Without Borders/Sisters Against Violent Extremism (SAVE), and in my work for them, I mostly do research and write grants. Women Without Borders and SAVE are both really cool organizations–Women Without Borders focuses on empowering women to participate in civil society and to be part of decision-making processes around the world. You can see our website at: https://www.women-without-borders.org/. SAVE is also a very interesting and unique organization. It is the first counterterrorism platform in the world, and we work to develop ways for women to be involved in efforts against violent extremism. The approach we take emphasizes long term prevention and deterrence–tools of “soft power”–rather than military force. We envision strategies in which women fight violent extremism on the ground in their roles as wives, mothers, sisters, and daughters. This is a fairly new organization, and you can see our website here: https://www.women-without-borders.org/save/. We work with women from all around the world, including Northern Ireland, the UK, Spain, Pakistan, Yemen, Palestine, Israel, India, Sri Lanka, and of course Austria. We are hosting a major working conference at the end of this week to brainstorm new and innovative ways for women to be involved in various ways and in their differing capacities in their homelands. I’m really excited about all of our work. So back to why I need to learn German–originally, I intended on staying only three months in Vienna, and my work doesn’t really require German. However, now I’ve been offered a full-time job to start immediately after my internship, and the language most often used at work is usually German. I hate not knowing what’s going on, so that’s incentive enough to learn German, but now that I’m actually staying here for a long time I am doubly motivated to learn German so I can make some friends! I think it’s really important to learn German to be part of Vienna–you can get along with just English, but it’s not really comfortable, and you’ll be missing a lot. This entry was posted in Allgemein on 22. February 2010 by Kate. Last Thursday, I learned a WHOLE NEW CASE, the akkusativ. So now I can say “I eat a sandwich” correctly. Clearly a very important objective. I can’t wait to learn the past tense so I stop sounding like an ogre. I eat sandwich. I cook food. I buy many things today at the grocery store. I want go to München. Ogre ogre ogress. Seriously, though, I can’t believe this is my last week of German class! I feel like I’ve just started to get the hang of the schedule, going from work to class, and I want to continue while I’m feeling so positive about learning! I also really want the same teacher for my next class… Ich liebe Reinhardt. For anyone thinking about taking beginning German at the Deutsch Akademie, rest assured that Reinhardt will help you through the pain and agony of not knowing how to say anything at all. And also the grammar forum of the DeutschAkademie has a nice posting about the difference between Akkusativ and Dativ. I love how things work out sometime–just as I start feeling like I’m never going to make any progress with German, I get my first feeling of comfort with the language the next day. It’s just a simple thing–we turned the page in the book, and we were learning how to say that things are broken or don’t work. The flashlight is out of battery, the car is out of gas, the lamp is unplugged. But the way to say something is broken is that it is kaputt!! This is a word that is used all the time in the US, in the Midwest, but it’s not an official word. I don’t know if it would even be in the dictionary. Everyone would know what you meant if you said it, though, and it really brought back memories of home. It made me feel so happy and good about German, and it really renewed my enthusiasm to get studying and start speaking! Sometimes, little things make all the difference. You never know what or when, but when that feeling of familiarity hits, it brings with it waves of good associations and feelings of home. Just what I needed to re-energize my studies. This entry was posted in Allgemein on 19. February 2010 by Kate. I’m feeling a little overwhelmed by German! I’m in A1, the most basic level, so I know that things can only get easier from here, but right now, German is SCARY. There are three different genders of nouns (masculine, feminine, and neuter). There are four different cases for those nouns (nominative, accusative, genitive, and dative). There are three possible definite articles in the nominative (der, die, das) and two possible indefinite articles (ein, eine). There are no rules to tell when a noun is masculine, feminine, or neuter. In the plural (in the nominative), the definite article is always “die,” and there is no indefinite article. However, there are nine possible ways to make a noun in the nominative plural. And there are no rules. And the adjectives have to match. So, basically… in my week of class, I’ve learned some vocabulary that seems infinitely dependent on other factors in the sentence and whose gender identity is beyond either good or evil. I long for a Romance language! At least with Italian or Spanish all you have to do is take a noun, take a verb, string them together with some vocabulary and call it a day. I guess I could look on the positive side… at least I’m not trying to learn a tonal language or something outside my own alphabet. Now that’s intimidating. This entry was posted in Mein Deutschkurs on 18. February 2010 by Kate. All around the city, you can see posters for the the “Wiener Eistraum.” The picture is very ambiguous and just shows the outline of a polar bear against a blue sky with snow falling around it. The reality is much more fabulous. The Wiener Eistraum translates to “The Vienna Ice Dream,” and it takes place right in front of the Rathaus in Vienna. The Rathaus is not a house for rats (or at least I hope not). It’s the town hall. And right in front of Vienna’s Town Hall is a huge assortment of skating rinks, restaurants, and snack bars. Welcome to the Eistraum! The whole set up is just incredibly beautiful. Anyone who visits Vienna at this time of year and braves the overcast weather and cold should reward themselves by going to the Eistraum. There are happy families skating around, teenagers acting all angsty and trying to decide whether or not to hold hands, lovebirds skating around the rink arm-in-arm, food, drink… everything. There’s also lots of loud pop music playing that seems totally incongruous with the majestic Rathaus in the background, and you can try different regional specialties–everything from Apfelpunsch to goulash from neighboring Hungary to cake to knodel (Austrian dumplings). It is so much fun, and such a welcome relief from the otherwise dreary weather! You can follow the link below to see a picture of a pretty happy guy with his cheese hotdog! There was actually cheese IN the hotdog… I don’t understand how that works, but it did! Then the whole thing was baked in a baguette. Love it! This entry was posted in Allgemein on 17. February 2010 by Kate. Anyone who was in Austria today might have thought it was Halloween! Pirates in the U-Bahn, Clowns behind the counter at the bakery,.. what’s going on?! It’s not even October! It’s Faschingsdienstag! The last chance for everyone to get out and party and let their hair down before the fasting season begins. 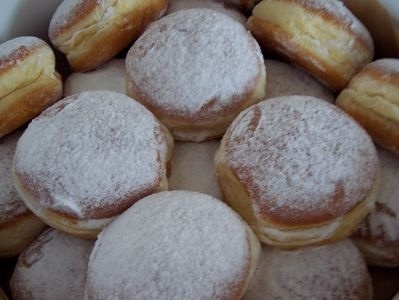 People dress up in costumes, drink a little too much alcohol, and eat lots of Krapfens! The time between Fasching and Easter is known as the fasting time, where people are supposed to eat less food and not drink any alcohol. This entry was posted in Allgemein on 17. February 2010 by Jessica. I know I’m posting this a little late, but Happy (belated) Valentinstag! (Happy Valentine’s Day). It’s definitely not a big deal here, but my boyfriend got me chocolate, so I was very happy. And it was delicious. The place where he got it is this amazing chocolate store called Demel, or “K.u.K. Hofzuckerbäcker Demel,” to be exact. This chocolate store is a must-visit for anyone coming to Vienna… or at least, for anyone who likes chocolate. Demel was established in 1786, right about the time where in my country they were deciding how best to govern the land they had just won from the British. It’s always interesting to put things in perspective like that. Ah, yes… when we were running around on horses trying to remember if it’s one if by land or one if by sea, other people were founding chocolate stores that would last endure to the present day. They have these fabulous window displays that change with the seasons to reflect the time of year, Vienna events, and so on. It’s a little like Marshall Fields at Christmas (a Chicago tradition known to everyone in the Midwest), but all year round and made of chocolate and marzipan. Yummmmmmmm! Just to add to the overall deliciousness of this blog post, I’m including another picture from the Demel website of a torte that you could order for your wedding day. This entry was posted in Allgemein on 15. February 2010 by Kate. My second class was just as good as the first. I really like my teacher because he is so kind and patient with everyone. I was very excited to learn more, and by the end of the three hours, my brain felt tired but full of new information. When I left class at 9:00, I had a very exciting experience–the Opernball was going on across the street! The Opernball (or Opera Ball in English) is the most famous, most prestigious social event in Vienna. It takes place at the Opera, but I didn’t realize it would be right at my feet when I came out of class! There was a red carpet, bright lights, and limousines driving up… I felt like I was watching the Oscars, except it was in Vienna and c-o-l-d. Apparently, the entire event is televised and shown as it is happening on public channel. I wish I could have watched it, but I don’t have a television here. I wanted to stay and watch, but there was already a huge crowd standing behind police blockades, so I couldn’t see very well. That, and it was cold. So I just got on the Ubahn instead and went home. The other exciting bit of news was that Lindsay Lohan was supposed to be at the Opernball, but she missed her flight to Vienna, so she didn’t make it! I can’t believe it. Everyone has been talking about her coming here, so it’s kind of unbelievable that she missed the whole thing at the last minute. According to the gossip magazines, she was shopping in LA and didn’t make it to the airport in time! Can you imagine? This entry was posted in Allgemein on 12. February 2010 by Kate. I’m a little late starting my German class… I couldn’t attend the first two days because of work, but last night (Wednesday) I went to my first class and I’m so excited! I’ve been in Vienna for almost exactly a month now, and I’ve had some ups and downs with adjusting to life here. Overall, Vienna is a beautiful city, full of amazing places to visit and cultural experiences I never imagined. I’ll have to write about my first ball in a later post! My biggest difficulty so far, however, has definitely been the language. From what I’ve seen, almost everyone speaks English, but it’s really hard to meet people and connect if you don’t speak German. I’ve been trying to teach myself a little, but it’s very different from other languages I’ve studied (the verb goes WHERE?) and so I haven’t had much success. Which is why it was so great to finally go to class on Wednesday! I’m in the very first level and it is so reassuring to be surrounded by people who speak just as much (or as little) German as I do. The pace seems just about right, and I really like my teacher. I’m so excited about finally getting a chance to really learn German with help and friendship instead of struggling through it myself. I’ll write a little more tomorrow–I have my second class tonight and I’m sure I’ll have lots more to talk about! This entry was posted in Allgemein on 11. February 2010 by Kate. Ever wanted to have a summary of the most important grammar topics in the German language? Print out the free grammar poster and hang it on your fridge, next to your desk, on the bathroom mirror, so you can remember the basic rules! If you want to have the coloured version, just drop by the DeutschAkademie office – we would be delighted to give you one! Beside the grammar poster, you can find more interesting and free stuff on this website! Check it out! This entry was posted in Allgemein on 8. February 2010 by Vera. Today we sent you our newest DeutschAkademie newsletter which – as always – includes a topic concerning a typical German/Austrian tradition, a special focus on German grammar and an extra feature. This month, we are describing the most famous dishes of the “Hausmannskost” (plain fare). Have you ever wondered what a Wiener Schnitzel, Sauerkraut or an Eisbein really is? Check it out in the newsletter, you might be surprised! Furthermore, we covered the Akkusativ. We are giving you examples and explaining the basic rules – when do you use Akkusativ? The special feature this month was a crossword puzzle – did you really get the vocabulary of the most famous dishes in Germany and Austria down? Give it a try and see if you can solve the puzzle! This entry was posted in Allgemein on 2. February 2010 by Vera.